Poland’s president and first lady will be buried on Sunday in a state funeral in Krakow’s Wawel cathedral, the historic resting place of the country’s kings and former leaders, officials said. Lech Kaczynski and his wife, Maria Kaczynska, were among 96 people killed on Saturday in a plane crash in western Russia, thought to have been caused by human error. Stanislaw Kracik, governor of Krakow province, said the couple’s funeral would be at 2pm (1200 GMT) in the 1,000-year-old cathedral, the main burial site of Polish monarchs since the 14th century. The last Polish leader killed in office, General Wladyslaw Sikorski, the exiled second world war leader who died in a mysterious plane crash off Gibraltar in 1943, is also buried there. Leaders expected for the funeral include the Russian president, Dmitry Medvedev. Kaczynska’s body was flown home from Russia today, and parliament held a special observance in memory of the president and MPs killed in the plane crash. Marta, the daughter of Maria Kaczynska, and the twin brother of President Lech Kaczynski, Jaroslaw, right, at Warsaw airport. 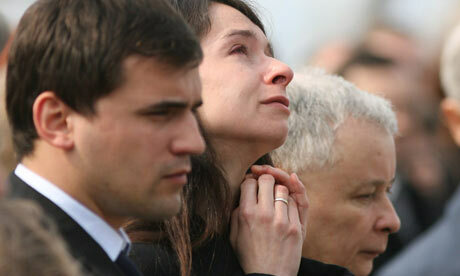 Her daughter knelt by the casket and wept as a Polish guard of honour stood by. Kaczynska’s body was taken to the presidential palace in a Mercedes-Benz hearse, as was her husband’s on Sunday. Thousands of Warsaw residents lined the route. The bodies of the first couple are lying in state in closed coffins in the presidential palace, where the president appointed and dismissed governments. The body of Ryszard Kaczorowski, the last president of Poland’s government-in-exile in London, will be brought back today and his coffin will also go on display. Investigators have suggested human error was to blame in Saturday’s crash, saying there were no technical problems with the Soviet-made plane. The Tu-154 went down while trying to land in dense fog at Smolensk in western Russia. All aboard were killed, including Kaczynski and dozens of Polish political, military and religious leaders. WARSAW, POLAND – APRIL 13: Mourners walk in silence by the coffins of late Polish President Lech Kaczynski and his wife Maria that were lying in state at the Presidential Palace on April 13, 2010 in Warsaw, Poland. They had been travelling in the Polish government-owned plane to attend a memorial in the nearby Katyn forest for thousands of Polish military officers executed 70 years ago by Josef Stalin’s secret police. The pilot had been warned of bad weather in Smolensk, and was advised by traffic controllers to land elsewhere, which would have delayed the Katyn observances. He was identified as Captain Arkadiusz Protasiuk, 36, and the co-pilot as Major Robert Grzywna, 36. Also in the cockpit were Ensign Andrzej Michalak, 36, and Lieutenant Artur Zietek, 31. Russian traffic controllers said the crew refused to follow their recommendations, a popular Russian daily reported. Traffic controller Anatoly Muravyev, who was part of the team that handled the plane, told Komsomolskaya Pravda that the crew ignored their warnings about worsening weather at the Smolensk airport. He said the head controller three times ordered the plane to re-attempt the landing and then advised the pilot to fly to another airport. “The crew did not listen, although the controllers warned them about bad visibility and told them to get ready to fly to a reserve airport,” he said.